New app serves as one-stop-shop for information on a child’s entire course of treatment. 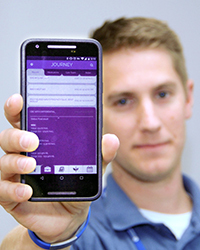 The app is the first to blend study data with data from the electronic health record in real time. Parents of children newly diagnosed with cancer carry a heavy burden. While still reeling from news of a diagnosis, they must quickly learn complex medical terms and procedures, meet sprawling care teams, manage frequent appointments and track test results. The new collaboration aims to lighten their load by creating a one-stop shop for information on a child’s entire course of treatment. Ahna Pai, PhD and Keith Marsolo, PhD are the lead Cincinnati Children’s researchers teaming up to develop a new mobile app as part of Pai’s Illness Management and Parent Adjustment to Cancer Treatment (IMPACT) study. Together, they are working to transform the 4-inch-thick binder of documents that parents typically receive upon diagnosis into a mobile app that also connects to the electronic health record in real time. Technical details on the creation of the app are detailed in this paper. Pai and her team, including registered nurse Caroline Morrison, came up with the idea of a new application. Pai and Morrison contacted Marsolo and his Biomedical Informatics team to see what could be developed. They were looking for a mobile platform to deliver a new behavioral health intervention they were testing and wanted to add in features that would be useful to parents. While Pai’s team interviewed parents, caregivers and providers to determine what would be helpful to include in a new app, Marsolo’s team began exploring possible technology platforms. The development team, which included Billy Shuman and Jeremy Nix, had to break new ground in designing a way to import real-time data from the patient’s medical record. 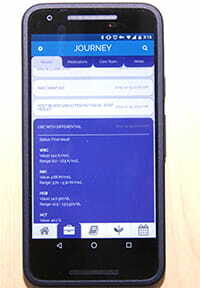 They succeeded in blending study data and EHR data in real time, making IMPACT the first mobile application to do so. They leveraged authentication and authorization protocols so parents could sign on with their current MyChart username and password, simplifying the log-in process. In response to parent requests that the technology work across all platforms, they decided to use the Java Enterprise Edition (EE) version 7 stack for the application development. This technology, though not typically used for mobile applications, was chosen to allow for full-text searching and to maintain a responsive user interface, thereby allowing a traditional website to function more like a native application. Their IMPACT app is accessible on iOS, Android operating systems and a desktop or laptop. University of Cincinnati design students working through the Livewell Collaborative helped Marsolo’s team by creating the user interface and user experience for the app. In addition to the behavior health intervention being tested by Pai, The IMPACT app incorporates current lab results, medications, and care team information, as well as background materials, definitions of medical terms, and explanations of common procedures and treatments. It offers a calendar function to keep track of upcoming appointments for the child by pulling appointments directly from the child’s MyChart account. Parents can also note questions within the app for future discussion. Pai’s team, along with co-investigator Larry L. Mullins, PhD at Oklahoma State University, is currently testing the efficacy of IMPACT through a National Institutes of Health-funded study. Participants are being recruited from Cincinnati Children’s Hospital and the University of Oklahoma Health Sciences Center.